Berat is a culminating point of any trip to Albania, Berat is one of the most beautiful cities of the country, which has remained as a city museum for the communist government. The Berat’s most showy characteristic is the collection of white Ottoman houses raising the hill up to the castle,for that reason this city was named with the title of “The city of thousand windows “. His environment of steep mountain is archetypal Albanian, and particularly evocative especially when the clouds move around the top part of the minarets and the battlements. In the third century B.C. a strength fortress ilirio called Antihomeland was constructed here in the site of a previous accession. The Byzantine ones reinforced the fortifications in the high of a hill in the centuries fifthly and sixth, as the Bulgarians 400 years later. The Serbian ones, which occupied the citadel in 1345, renamed the fortress Beligrad (white city) and it is inspected that the name of the village comes from there. In 1450 the Ottomans took Berat, and after a period of decadence Berat’s city began to prosper in the 18th and 19th century as center of crafts, specialized in carved in wood. In a brief time in 1944 Berat was the capital of the liberated Albania. 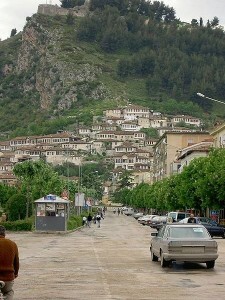 Berat suffers terribly for the cuts of energy in the winter, and the generators are not in use widely. Whereas the river Osum that divides the city is dirty enough, the streets are relatively free of the garbage that covers the country. Even we saw a team of sweepers in our last visit to Berat. There is several cash dispensers and a cybercafe in the principal avenue. The region of central Albania includes the cities of Berat and Durrës. With miles of coast and its proximity to Tirana, Durrës must be a excellent beach resort. Actually, it is dirty and contaminated, and it is not possible to swim without traversing the risk of infections of the skin. It is a sad follow-up of the great thing that the country has deteriorated since the resorts were constructed here in the times of the communism. The swimming is an excellent sport to practise the long of the coasts of the Adriatic Sea and the Ionic one, with the exception of the contaminated section that goes from Durrës de Fier. Tirana beside being the capital of Albania is a beautiful city, animated and very coloring city. Tirana has changed beyond the belief that in the last decade had of being a boring, gray city as if it was at some time. It is incredible what a lick of paint can do in Tirana – covering an ugly tower with orange and red horizontal, different stripes with concentric circles of pink and purple color and the plantation of buckets cheating the perspective on its neighbor in Tirana. The mode Blloku buzzes is mixed by the dressed well bourgeois nouvelle in bars or boutiques in Tirana. Where your money is an object of many speculation in this economically depressed country, but thankfully you do not need much of it to have a night of amusement in the numerous bars of the city and night clubs of Tirana. The boulevards of the part grand central of the city of Tirana line up with the relics of its fascinating Ottoman, Italian and communist past – from the delicate minarets to the murals socialist – guarded by soldiers of bored aspect with dangerous automatic weapon. The traffic is terrible everyday and with the pedestrians in a constant scene of absolute chaos. At any time of the day the half of the ways seem to be raised in Tirana, though it could be difficult to know where the road finish the work and where begin the pot-holes. 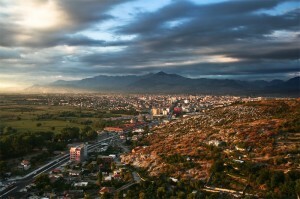 Very high place, crazy, colouring and dirty – Tirana is simply fascinating. The notions of Albania like a wild border of the shaded mountains and villages that the time forgot have their roots in the north. The landscape of the north of Albania is a mixture of a rich fauna, marshes and lagoons about Shkodra and the implacable coast of the Adriatic Sea, and high mountains, Bjeshkët and Namuna (Damned Mountains), in the North-East. The visits to these mountainous regions still simply some element of risk due to the reactivation of family traditional revenges and the increase of the organized delinquency. The tourists are not probably caught in this, but the incidents, as the gunfire in a bus at the beginning of 2006, they happen occasionally. The low lands, including Shkodra and the corridor of the principal road of Tirana to Montenegro, are perfectly sure. With its spectacular environment on the banks of the biggest lake of the Balkans and the support of impressive mountains, Shkodra was once the most powerful city of the region and nowadays it continues being the center of the culture gheg and the Albanian catholicism. Now it is a bit more underestimated and suffers from terrible blackouts in winter. Nevertheless, its superficial local knowledge is fascinating and contributes to a good introduction of half day to Albania to those who enter from Montenegro. With the most attractive line of coast of Albania, Saranda is a small and charming village. Its beautiful houses in the hillsides, the small ships in the blue sea and the people that one walks for maritime walk, enjoying from 290 days of the Sun to the year do that Saranda one of the most beautiful places to visit in Albania. 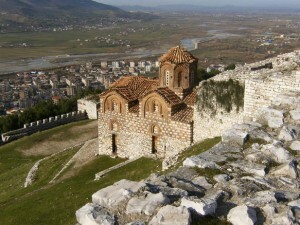 Ayii Saranda, a former Christian monastery dedicated to 40 saints gave its name to the village. Saranda is shot of stone of the Greek island of Corfu (12,5 km) and it is a good point of crossing between both countries. 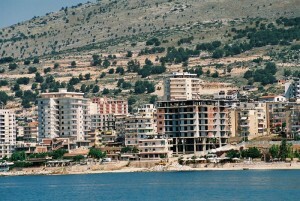 The majority of Saranda’s attractions are a bit out of the proper city. Near Saranda one finds the fascinating archaeological ancient site of Butrint, the hypnotic Syri i Katterc (blue Spring eye), and some beaches in the village of Ksamili, where you will be able to relax after a day of tourism. Keywords: Principal cities of Albania. main places to visit in Albania. What to visit in Albania. Cities in Albania. Tourism in Albania. Travel to Albania. Berat Albania. Central Albania. Durres Albania. Ionan Coast Albania. Tirana Albania. The north par of Albania. Shkodra Albania. Saranda Albania. Most popular places to visit in Albania. Albania is one of the most beautiful Balkans countries. Albania is a Balkan country.